Federico Moreno Torroba was one of the most important Spanish composers during the twentieth century. Spanish folklore permeates most of his works and he contributed to most genres. He achieved great popularity in his native land with his many colourful zarzuelas, the Spanish form of operetta. Best known is, I believe, his masterwork Luisa Fernanda (1932), of which there is a delightful DVD recording, featuring José Bros and Plácido Domingo (review). But for international audiences his name is synonymous with compositions for guitar, nearly one hundred of them, most written for Andrés Segovia, among them ten concertos. 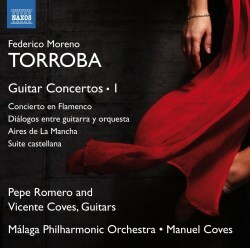 Three of the works on this disc were also composed with Segovia in mind. The one that wasn’t is the Concierto en Flamenco. This is a tricky hybrid – or let us call it cross-over music. The problem is that it requires a soloist with exceptional capabilities. Flamenco guitarists in general do not feel at home in the classical world and classical guitarists are not often familiar with the flamenco idiom. The Concierto was written for and dedicated to the legendary flamenco virtuoso Sabicas (Agustín Castellón Campos 1912–1990). Naxos claim that the present recording is a world premiere, which I wouldn’t doubt, but googling the title I found information of a 1962 Decca LP recording with Sabicas including Concierto en flamenco. Looking at details I became confounded, because the LP accounts for three movements while the work we hear on the present disc has four and the titles of the movements are differently named. I wouldn’t like to spend a night trying to dig deeper but wonder whether there is someone out there reading this review who can clear up the mystery. Anyway there does exist one guitarist with roots in both traditions and that is another legend, Pepe Romero. At 69 when the recording was made, Romero plays as marvellously as ever. He appeared on the concert stage for the first time aged 7 and since then has played innumerable concerts as soloist and as part of Los Romeros (review ~ review), the quartet founded in 1960 by his father Celedonio and his two brothers Angel and Celin. Melodious, rhythmically enticing and colourfully orchestrated this is a valuable addition to the concerto repertoire – in case there are guitarists out there who are masters of both styles. I am no specialist in flamenco music but to my unschooled ears Pepe Romero’s playing sounds totally idiomatic. His formidable technique as well as his sense of rhythm and sensitive musicianship should win over even listeners with little or no knowledge of or interest in this kind of music. I admire all kinds of professionalism, whether the pro is an artist or a Formula 1 driver. Pepe Romero’s professionalism is on a par with the extreme sensitivity of, say, a Formula 1 driver for whom even a microscopic mistake can be the difference between life and death. Thirty-three years before the present recording, in 1980, Romero was the first to record Torroba’s Diálogos. It was originally composed for Segovia in the early 1960s but later revised and premiered by Michael Lorimer in 1977. It is here allotted to Vicente Coves, who was not even born when that first recording was made. Diálogos is lighter in texture than the Concierto, more chamber music in character and more lyrical. It is beautifully played and the Andante is a piece of rare inward beauty. The finale is more outgoing but still permeated by an autumnal haze. Torroba was 86 when he revised the work. The two suites for solo guitar were composed circa 45 years apart but with a common denominator: Andrés Segovia. The five short pieces constituting Aires de La Mancha from 1966 have caught the flavour of the folk music of La Mancha in central Spain. This was also the province of Don Quixote. He is evoked in La Pastora, recalling the shepherdess Marcela. Pepe Romero plays the suite with his usual flair. Suite castellana contains Torroba’s first composition for guitar, Danza, to which he later added the two other pieces. Segovia premiered the suite, published it and recorded it. Vicente Coves plays the suite with loving care and intimacy. Compared to David Russell on a Telarc CD from some years ago (review) he is considerably slower in both Arada and Danza. Russell’s more muscular approach may be more in line with the original. He and Segovia (in 1944 as well as 1949) take Arada in identical tempos. However, Vicente Coves’ more contemplative reading is valid in its own way. The Málaga Philharmonic Orchestra, a body founded as recently as 1991, turned out to be a pleasant surprise. The recording is excellent and the informative liner-notes were written by Walter Aaron Clark and William Craig Krause, co-authors of Federico Moreno Torroba: A Musical Life in Three Acts (Oxford, 2013). Constantly inspired and inspirational music lovingly performed by devoted musician: this should be a source of delight for many listeners – even those unfamiliar with Torroba.